TFV4 tank is becoming one of the most popular vape tanks on the market. This revolutionary design tank is manufactured by Smok, one of the leaders in vape manufacturing. 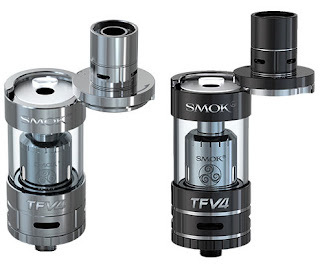 Smok TFV4 measures 24.5mm by 50mm while its glass tube’s diameter is 25.5mm. It is made from stainless steel and weighs 74g. The tank’s capacity of 5.0ml, improved airflow, and swivel top lid are just a few reasons why this tank consistently gets great reviews. The vape tank features a 0.2 ohm triple coil head, which has three coils that are rated at 40-130watts. Besides this, it has a unique turbo head, which comes with double Clapton coils that have a rating of 50-140W and a resistance of 0.28Ω. Cotton is also included in the packaging whenever you purchase a new unit. A 0.2 Ω sextuple coil that is rated at 50W-240W is also included with every purchase. Besides this, a new unit comes with an extra glass tube, a user manual, and an assortment of replacement parts. You will surely fall in love with the vape tank at first sight since it has a refined, precise, and thoughtful design. Its robust build quality makes it even more appealing. The vape tank’s incredible design is accentuated by an original rotating cap top fill, which has helped distinguish TF-series vape tanks from similar products in the market.